A constant light intensity is expected; this is approximated in the real capturing process by a constant distance between light and subject. The subject's surface is expected to be monochrome and lambertian, i.e. perfectly diffuse with no highlight reflections, refraction or light bouncing. Any deviations from this model are not considered in the surface normal calculation. 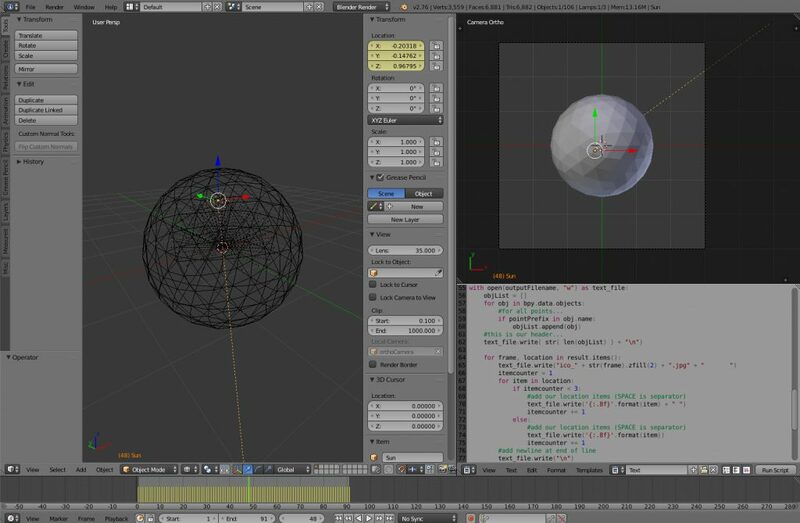 To test the absolute accuracy of the RTI files, I constructed a virtual environment in Blender, eliminating all possible external error sources. As for rendering pipelines inside Blender, I chose the Internal renderer. Although the Cycles renderer gives more photorealistic results, it does so at the cost of mathematical models of lighting, which are far more convenient for establishing ideal lighting conditions for this test. I wrote a Python script that handles light placement, frame creation, and the export of a light position file for the RTIBuilder. How do the values in .LP relate to light positions in x, y, z? Are the values really normalized in -1 to +1 range? How accurate are those calculations? An initial test involved checking the general light position calculation accuracy of the HSH-Algorithm employed by the RTIBuilder. 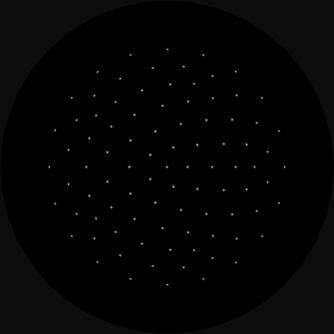 A highly subdivided and smoothed icosphere served as the black reflective sphere; its material and rendering properties were chosen so as to minimize the reflective highlight to an area as small as possible, thus further aiding the HSH-algorithm's highlight detection precision. 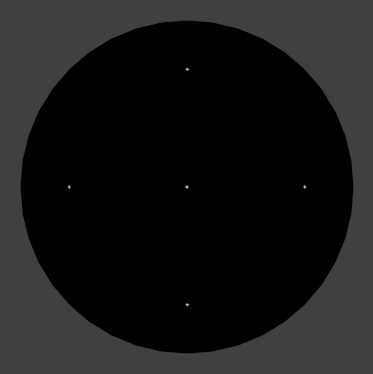 Five pictures under different extreme angles were produced: horizontal N, S, E, W and zenith; only absolute values of -1.000000, 0.000000, +1.000000 were used as light coordinates (see blended image left). 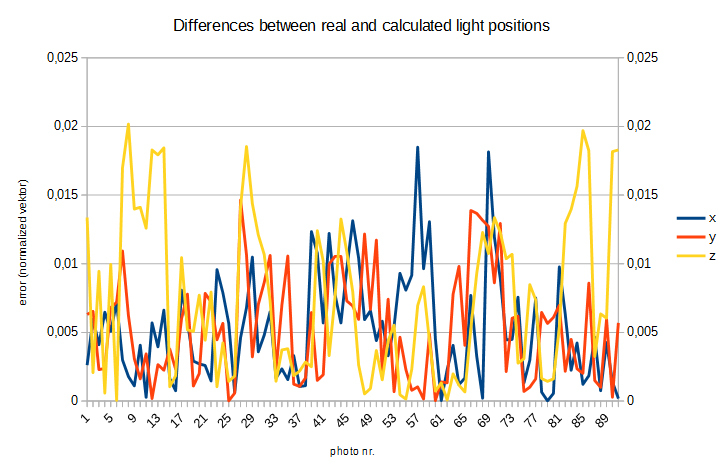 The real corresponding light positions were noted and the pictures were processed in the RTIBuilder. 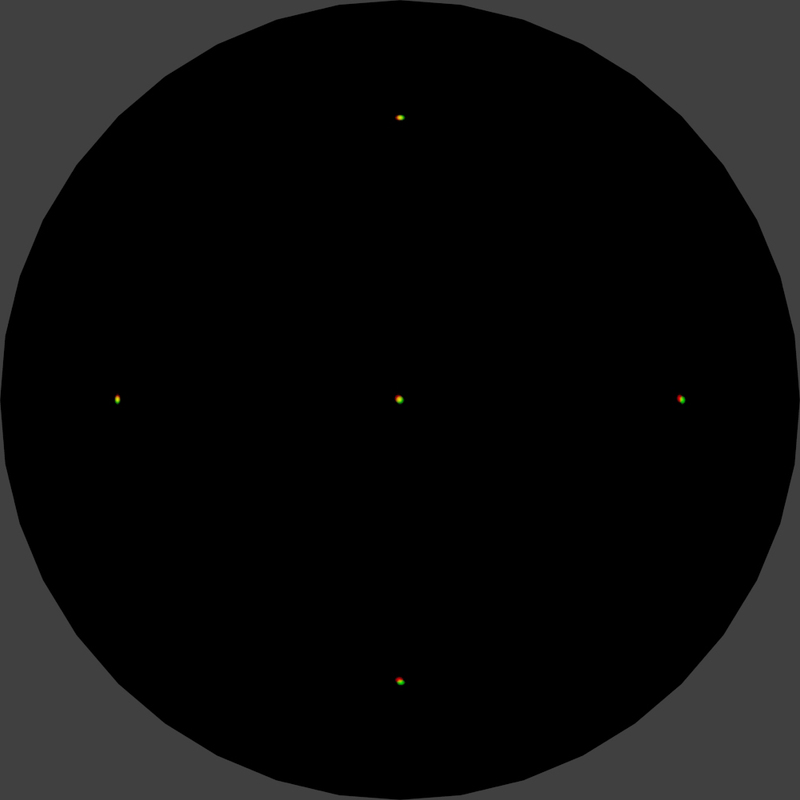 The Sphere detection was surprisingly accurate in position and radius and only off by 1/10th per cent of the image width. 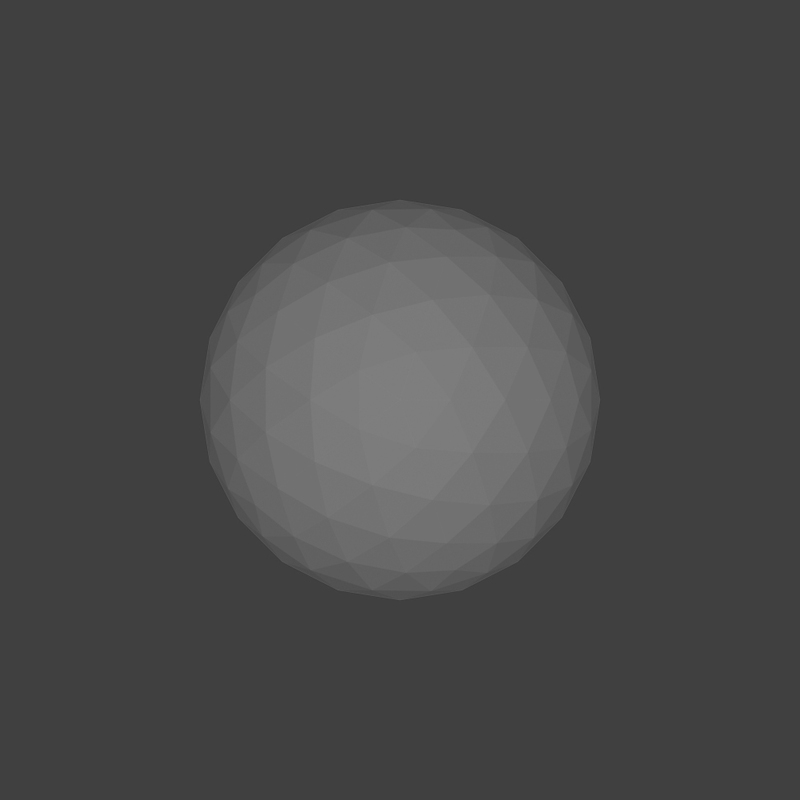 The Highlight detection was able to correctly identify all highlights on the sphere. On visual inspection, these errors seem to be neglegible, and may be solely attributed to floating point inprecision. 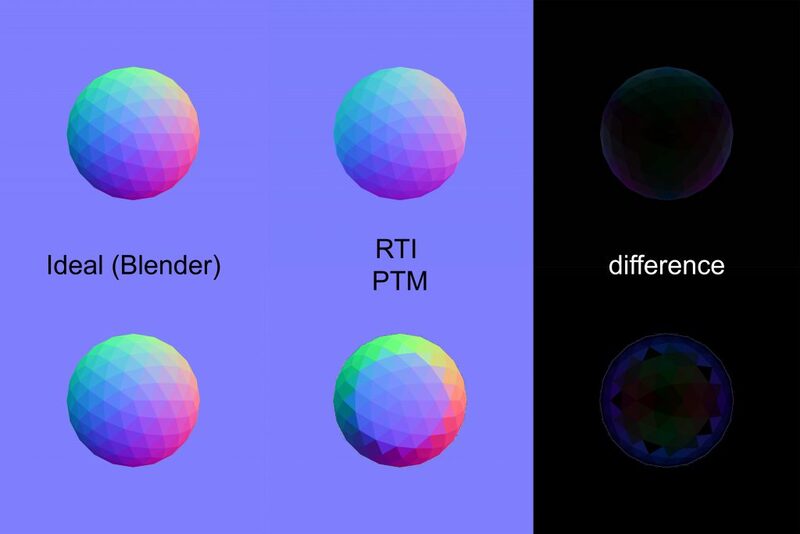 In general, the normal map extracted from an RTI-file exhibits fewer errors than the one from the PTM-file. Both show higher errors in the blue channel (z-coordinate of the surface vector), which seems to correlate with the higher errors for the z-values in the previous test. Another possible explanation could be a systemic problem in the way these fringes are illuminated. These differences are best visualized by a mean of all captured images (see below). Since the topmost surfaces on the sphere are illuminated by almost every lighting angle, a more precise normal calculation for those surfaces might be possible. On the other hand, the lowermost surfaces are often not illuminated at all, thus limiting the lighting angles usable for normal calculation.